Joico K-Pak Collection contains the highest concentration of Quadramine Complex in its formulas, so that Joico K-Pak can deliver the ultimate in healthy hair. 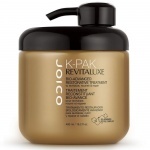 Joico K-Pak Collection products work synergistically to rebuild, reconstruct, strengthen and protect damaged hair. Joico's mantra is 'Think Healthy Hair' and this range of Shampoos and Cleansers by Joico aims to make your tresses look the healthiest they can be, whatever your hair type. Joico have created special shampoos for dry, chemically treated hair, normal hair and oily hair, to soothe and treat these specific hair types. Joico K-PAK Daily Conditioner is a hero for damaged hair. Joico K-PAK Daily Conditioner zeroes in on that ravaged cuticle, filling in the battle zones with moisture, silkiness, and strength so nothing tangles with your tresses again. Joico K-Pak Revitaluxe instantly repairs years of damage, doubles your resistance to future breakage, and protects against color fade (by 94%) with a single application. Joico K-PAK Intense Hydrating Treatment is the cocktail of choice: a profoundly nourishing treatment (at a gentle 3.5 PH level), offering immediate hydration to hair that’s gasping for air. Joico K-PAK Leave-In Protectant detangles your post-shampoo snarls, adds significant shine and seals the cuticle,rendering hair immune to the hazards of heat! The perfect choice for preventing hair damage! Joico took everything amazing about the Deep Penetrating Reconstructor, and tweaked it into a light, liquid formula that’s ideal for those with fine, fragile hair in need of a featherweight miracle-worker. Joico K-PAK Smoothing Balm is a heat-activated styling tool that tames frizz into submission, while leaving behind a shield of protection that keeps hair luminously sleek and straight. Looking for that perfect-for-any-day finishing spray that gives you just the right amount of hold? The kind that still allows you to play, fiddle, and tweak your style after you’ve spritzed on a layer or two? 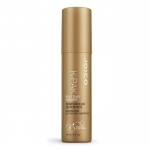 Look no further than Joico K-PAK Protective Hairspray! Joico K-PAK Split End Mender contains a newly formed polymer-polymer complex that has high attraction to hair and forms a strong adhesive structure holding the split end together better than any styling product.